We’re still enjoying the last of summer’s heat and humidity, but September is here, fall is in the air, and it’s back to school season. Fall has always been my favorite season, and even though I’m no longer a student, my yearly calendar still resets this time of year thinking about back to school shopping and sweater weather. So, here’s what is topping this month’s wish-list . . .
It’s been a long time since I’ve owned a pair of high top sneakers, but these fun wool Supergas are now topping my fall footwear wish-list. Reese’s feet are growing like crazy and she’s gotten so much wear out of her first pair of comfy Freshly Picked moccasins that I’m definitely getting another pair. 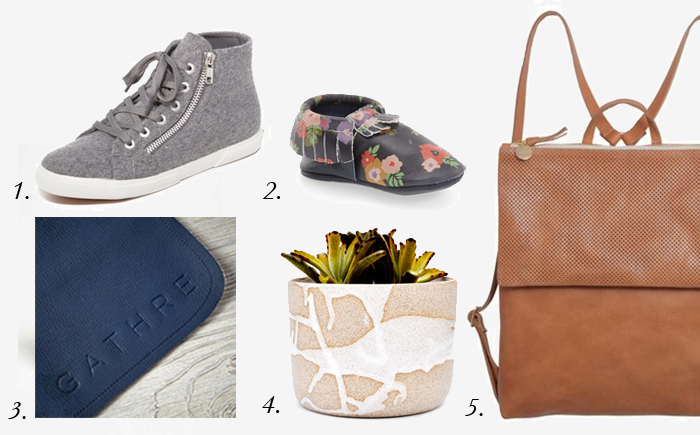 This navy floral pair is so adorable, but I’m also loving the salt gray pair. Have you heard of Gathre? They make these amazing leather play and picnic mats that are compact, wipeable, and water resistant. I’m excited to try out the micro mat as a travel changing pad and the mint midi mat at the beach in just a few weeks. This unique ceramic planter would be the perfect complement to my little living room plant collection. So I may not be going back to school, but I’m definitely considering a new backpack.